Today it’s a double whammy for pasty lovers: the government backtracks on the infamous pasty tax; and I share Lorraine’s pasty recipe. Today’s news signals the end to a short but passionate battle by bakers to change the budget measure. I had hoped to see the people of Cornwall throwing boatloads of pasties into the sea, but it was not to be (explanation of humorous historical allusion here). So it’s over. We can breathe a sigh of relief that our savoury goods are safe, and that we shall soon see an end to punning headlines (“George Osborne gets his fingers burnt as flaky pasty tax crumbles. Labour critics say ‘If you can’t stand the heat, get out of the kitchen,’ as this latest hot issue leaves a bad taste in the chancellor’s mouth.” etc.) It’s time for pasty lovers to celebrate. You could go out to Greggs and tuck into a pasty there, but why not make your own? You could even start up a small business selling them, from your untaxed static caravan. Now is probably the time to admit that I am not a pasty lover. In fact, I detest them. My only beef (get it?) with the pasty tax was that my beloved sausage rolls might go up in price. 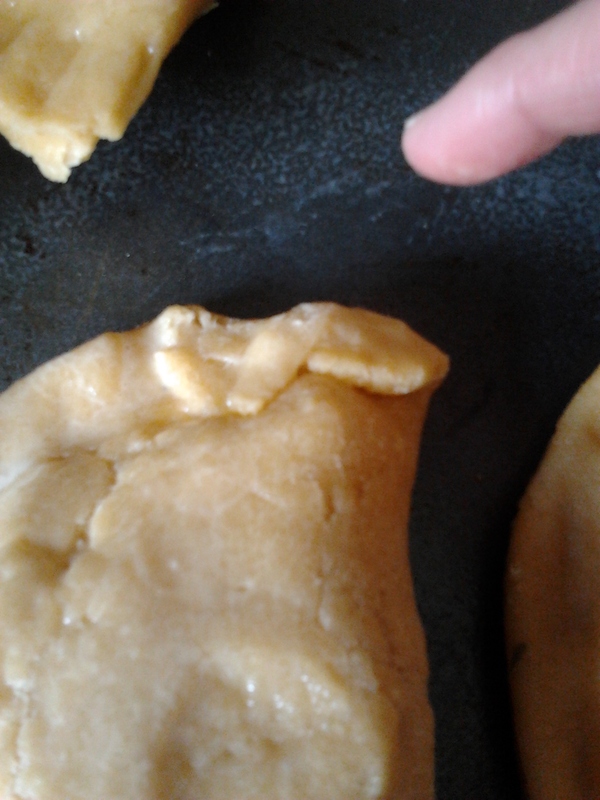 Ever since I had a bad experience with a pasty in childhood, the smell makes me nauseous. But I decided now was the time to try to put the incident behind me and move on. I think I’d always assumed you had to cook the filling of a pasty and then put it in the pastry but, in Lorraine’s recipe at least, the filling goes in raw. And it’s all very easy to make and assemble. I made the pastry in the food processor. Its 500g flour, blitzed with 175g butter. I then needed to add 3 eggs to bind it together (but it will depend on the size of egg). The filling is beef mince, potato, onion, swede, garlic, herbs, worcestershire sauce and butter. The predominant smell was rosemary, which was a relief to me. There’s not much wetness in this filling as you can see, and it did turn out a little dry. Any suggestions of what you could add to make it wetter? 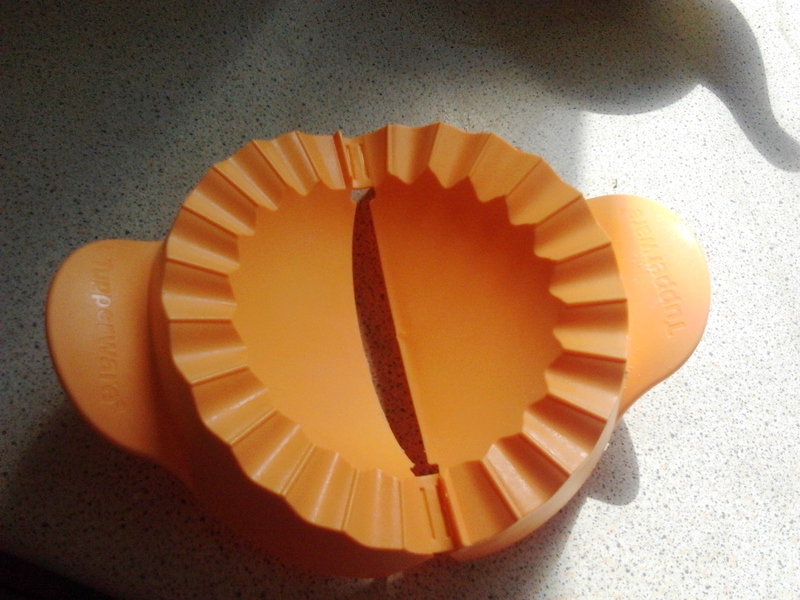 I cut out circles using a pan lid as Lorraine suggests. Then it’s on to artistic edge folding. The traditional Cornish way is lying flat on its side in a D-shape, with a folded edge. You start at one end and fold the corner over. 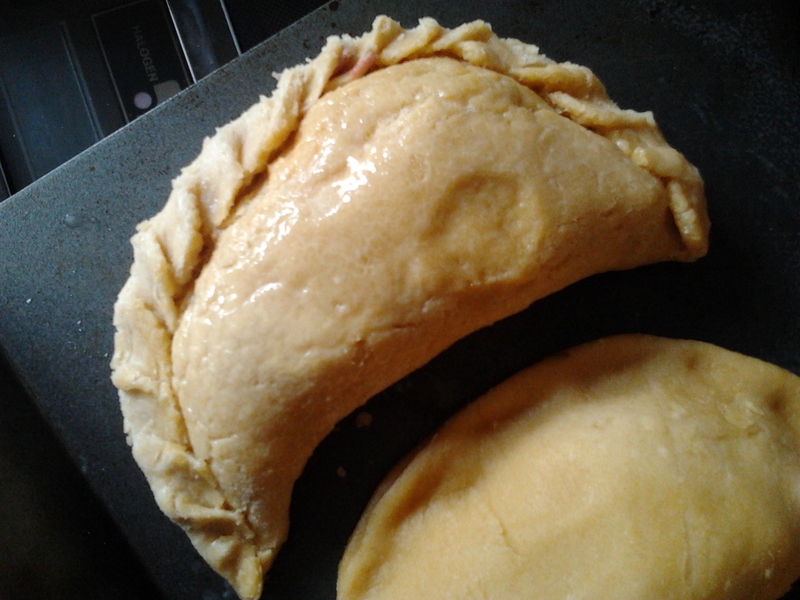 Continue in this way all along the pasty, then brush the completed pasty with beaten egg. 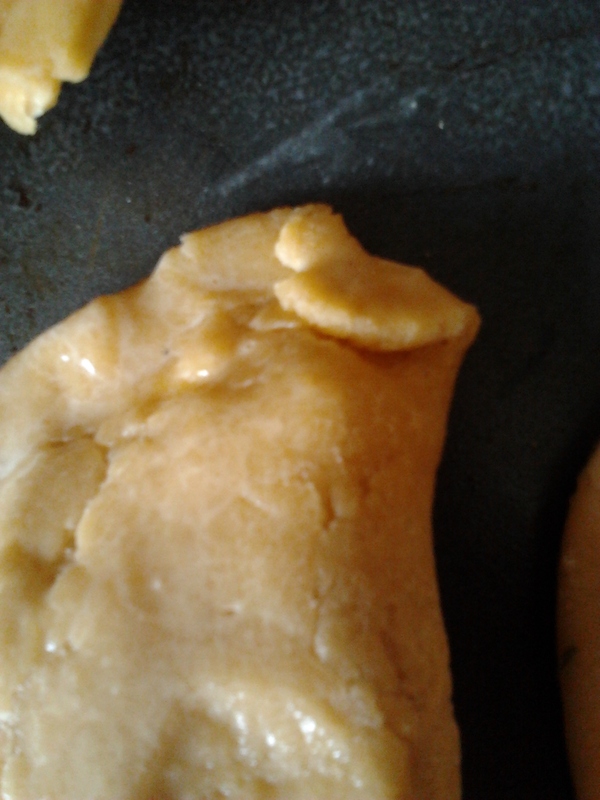 I happen to have in the cupboard a pasty making mould (free gift I think). So I made a couple of small ones with that. It wasn’t particularly quick, but maybe if you were trying to do loads, it would be easiest. The pasties were nice, though I would make the pastry thinner next time – it was definitely “sturdy.” They tasted quite fresh and herby and I actually enjoyed it. But I’m not sure that’s what a real Cornish pasty tastes like, so I’ll still be wary of the real thing! Note: Lorraine’s recipe is called “Not-so-Cornish pasties…” because the name is protected. 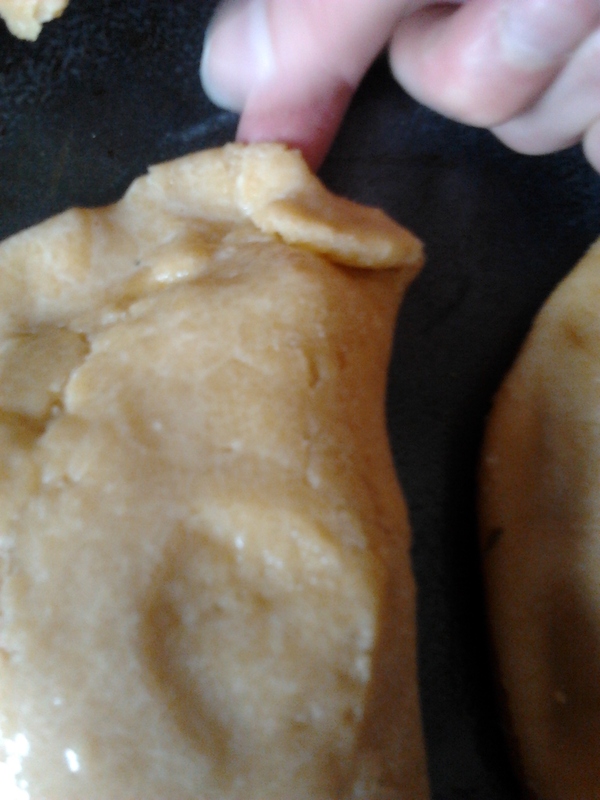 Cornish pasties have to made in Cornwall and cooked to a traditional recipe.